And the WINNER (s) IS !!!!! Good morning or should I say, good afternoon, because by the time I get this finished, it will be afternoon. When I got home Sunday afternoon, and I got everything unpacked and had time to rest before I checked my email. And, I was so surprised, to find my email box, so full of comments. And, I will answer each and every email, just give me time to get though them all. And I really appreciate that y'all like my block. I, thank you !! But I hope to see some pictures coming my way of wall hangings, table runners, pillows and quilts made from the block. I am also, glad to see that y'all have gotten your imaginations going after reading that I suggested you, use flowers you like. One lady even said she was going to use birds instead of flowers - - I am waiting to see pictures of that piece !!!!!! But, I wrote all the names down ( really cut and pasted) and then my granddaughter pulled the names, luckily she didn't have school yesterday. And thank y'all for the comments about your gratitude for serving this country. Back on track !!!! Any way, my granddaughter pulled two names, and I did not have the heart to put the second name back in the hat. Vivian - - - sweetlildaisy5566, from NC and the second name that was pulled is - Jodi - - - usairdoll, Not sure where Jodi is from. But I hope these ladies, both enjoy the magazine and will send me pictures of their finished quilt pieces. So if you read this before your email, please get in touch with me by email. . I am still not the best on computers, but still learning when I have the time, And I promise to try to post more often. I want to try for once a week, but sometimes that will not happen espeically if I am out of town teaching someplace. Have fun quilting and hopefully I will hear from some of y'all !!!!! 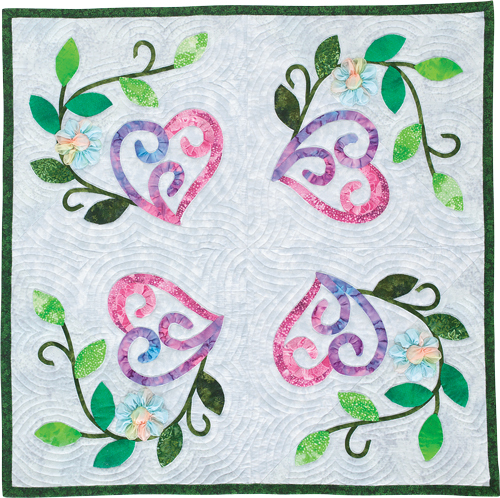 Quiltmaker's 100 Blocks Vol 6 blog tour !!! Quiltmaker's 100 Blocks Tour !!! Again in Vol 6 !!!!! of the roller coaster of life, things are starting to look up again. and it is also in the magazine. Here is the wall hanging I made with my blocks and you will notice that I have added flowers to my blocks. On this wall hanging I only added one flower to the block, but if you want to add more flowers, then by all means do so. I like to make my patterns look complicated, but are really easy to do. You will find that the leaves are the only pattern that you need to cut out. 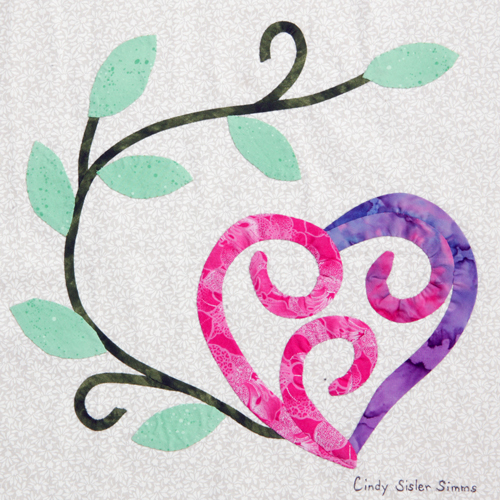 the rest - the vine and the heart are all made by using bias tape. If you are using my pattern, you are making a piece for you or someone who is important to you, so use the colors you or they like and the flowers too. Don't be afraid to add more flowers, then are showing here. 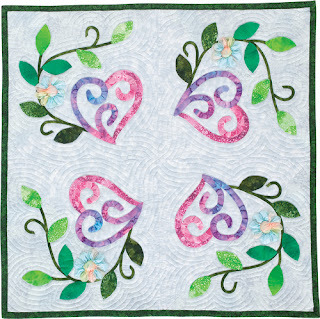 I do hope you all will go to the web site of Quiltmakers - - here is the link - - http://www.quiltmaker.com/100blocks.html and a link at the top of this post. And see the other artists and their blocks that are doing the blog tour. 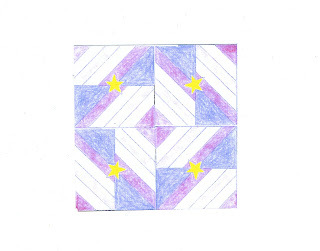 For those who stop by my blog and leave a comment about my block and wall hanging, and along with the comment, leave their name & email address ( have to be able to reach you if your name is picked) , someone will be picked as a winner to receive a complimentary copy Quiltmaker's 100 Blocks , Vol 6. Again, I will put everyones' name in a hat on Monday, the 12 and my granddaughter will pull the winning name. Unfortunately, I am scheduled to be out of town from Friday morning, Nov 9 until late Sunday evening, Nov 11. So I will get to read all the comments when I get back. I can't believe it has been a year since I have posted to my blog. But things like family, car problems & an car accident, along with some health problems had taken their time from my quilting and teaching. First things first, I am part of a Row Round Robin Quilt on - Patchwork Posse - web site http://patchworkposse.com/ - then follow the round black circle in the blue box, that says Patchwork Posse Round Robin. It will take you to the page with the rows published so far. Mine will be the last one, for now, I think!!!!! I was having trouble getting onto the Patchwork Posse's Round Robing ( still can't get on) becuase I am not the best there is when it comes to computers. I get stressed out !!!! But the theme for this round robin, was "Summer Picnic" . And when I think of summer picnics, the 1st thing that pops into my mind, is the "Memorial Day" and " 4th of July " picnics, that were so very important while growing up and to all military familys world wide, they still are. But the flag is also part of this country's and our history and what it stands for. So I was playing around with a square just drawing lines to sort of show enlisted strips and the next thing I had this block. Then when I had the blocks made up in fabric, before sewing together for the round robin row, I started playing with the layout. And here is what I came up with - - a block that I call - "Twisted Star " So I hope you have fun with it after you finish your "Round Robin Row Quilt ". The first picutre shows how you can use the block as a border and the second picture shows what you can do with four (4) blocks joined together. for when you join four (4) blocks together to form a lager block. YOu will come up with an optical illusion top . 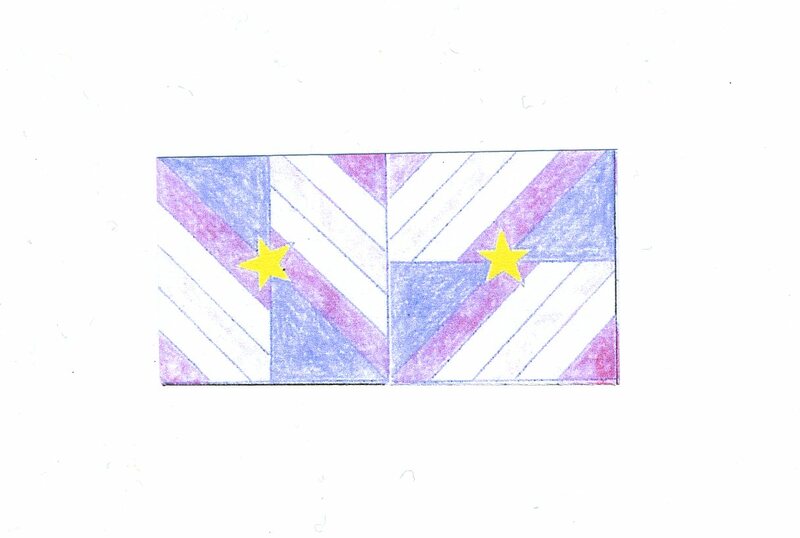 I would love to see pictures of any quilts made for my design. Well, all, it has taken me a little while to figure out this blog again, so I will close for now, and will post some new classes I have designed with pictures, soon. Have been married 41 years,have 3 grown daughters,6 granddaughters.Have been quilting for over 55years and teaching both quilting & sewing classes for over 35 years all over the world or at least where the USArmy would station my husband.